What's for Dinner: Stuffed Shells. You can make the components for this a couple days ahead of time if needed - i.e. sauce, filling. Also, you won't be able to fit 25-30 shells in your pan, but a few are always casualties of the boil, so I call for more than you'll likely need. Oil a 13 x 9-inch / 33 x 23-cm baking pan, or equivalent, and sprinkle the zest of 1/2 the lemon across it. Set aside. Get a big pot of water boiling, and preheat your oven to 350F / 180C with a rack in the middle. To make the sauce, combine the olive oil, red pepper flakes, sea salt, and garlic in a cold saucepan. Stir while you heat the saucepan over medium-high heat. Saute just 45 seconds or so until everything is fragrant - you don't want the garlic to brown. Now stir in the tomatoes and heat to a gentle simmer, just a minute or two. Remove from heat and carefully take a taste (you don't want to burn your tongue)...If the sauce needs more salt add it now. Let cool. 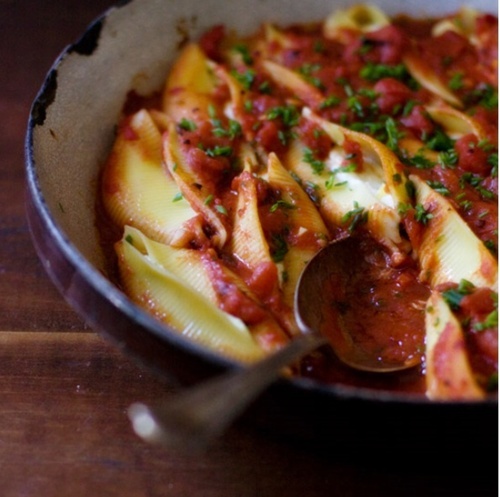 Images and Recipe via 101 Cookbooks. 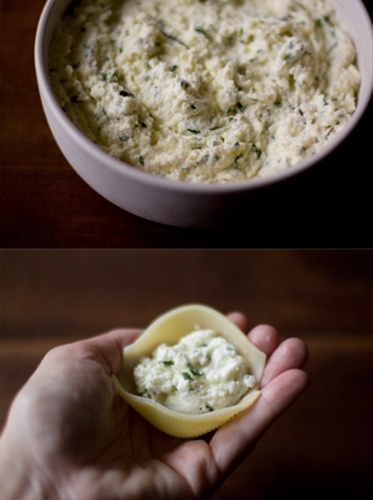 To make the filling, combine the ricotta, egg, and salt in a medium bowl. Mix until combined, then stir in the mozzarella, remaining lemon zest, and 3/4 of the chives. Set aside. Cook the shells according to package instructions in well-salted water - until al dente. If you overcook, the shells will tear as you attempt to fill them. Drain and let cool long enough to handle with your hands - see photo. Spread 1/3 of sauce across the bottom of the prepared pan. 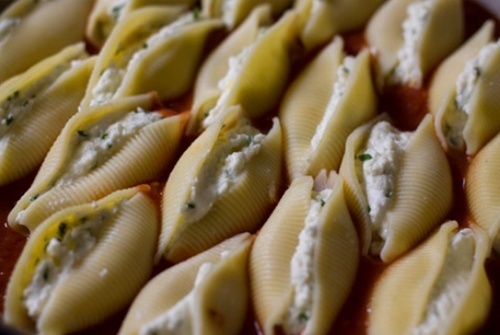 Fill each shell with ricotta, and arrange in a single layer in the pan. Ladle the remaining sauce over the shells, cover with foil and bake for 45 minutes or until the shells are cooked through - uncover for the final 15 minutes. Sprinkle with the remaining chives and serve hot. Have a delicious week everyone. Man this looks delish...im going to try this! Hiya chickie! Oh my gosh these look awesome. I make these, too, but I add extra cheese on top. I love how they look without the extra cheese. I'll have to try that next time. yum yum. Thanks for linking up during the Alexa Blog hop. Link up every Thursday if you can. It really helps your ranking if you link up and comment. This looks soooo good...such a fan of pasta!! This looks amazing. How did you know Italian is my favorite kind of food? :) Thanks so much for stopping by my blog!